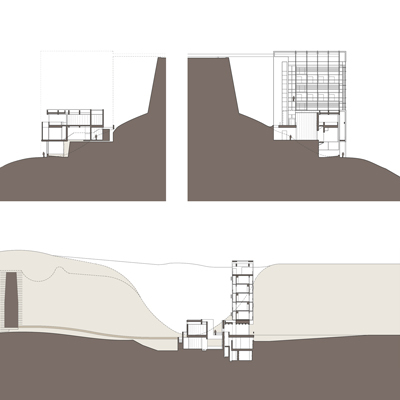 Chachapoyas, Peru — Amoia Cody Architecture D.P.C. This design displays homage to the traditional culture of the Chachapoya by making reference to the visible elements of the Kuelap: the raised platforms, the circular forms, and the decorative masonry friezes (zigzags and rhomboids). These elements are inclusive as experiential surfaces and spaces that one references and inhabits in the proposed Lodge-Museum Landscape. Aside from these visible elements, there is the experiential scale phenomenon of the site. This phenomenon is found in the vast open landscape and the narrow compressive vertical entry and exit portals that lead one to the platform of the Kuelap. The contrast between the openness and the compression of the landscape establishes a dynamic experiences. This design emulates this experience by contrasting: open and closed – inside and outside – portal and bridge – form and structure. 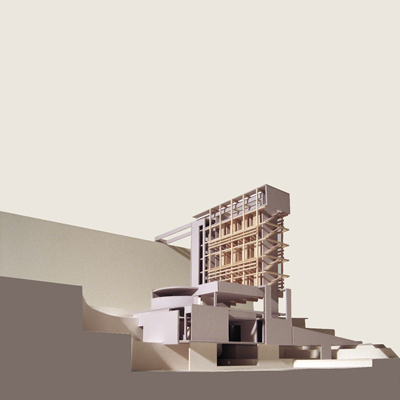 The design starts by turning the existing and direct vertical line of travel into a moving horizontal line which surfaces onto a new raised platform housing the museum and a progressive entry to the lodge. The entry portal is formed by the upper platform circulation over the head and the lodge services along side. As you bridge onto the platform, the circular form of the museum is revealed and reflected at the base via an evaporative pool. Beyond, in the distant view, the circular form creates another portal. This portal is between the circular form of the museum, exterior court, and the bar of the core and lodge services. Here the base and the circular form become integral with the landscape, marrying the contours of the land. One can bypass the museum entry at this point and progress upward toward the upper platform, discovering the core and entry to the lodge. One may also continue directly into the museum reception. The circular form pulls you into the Temporary Exhibit Hall #1. An option to go down to the administrative services is secondary. At the center of Temporary Exhibit Hall #1 is an exterior exhibit courtyard. Here the water collection from the cistern below is revealed and your memory of the reflecting pool is referenced. Beyond the exterior courtyard, is the Permanent Exhibit Hall, where the site model is viewed and light wells offer glimpses to the walls of the Kuelap. Beyond the model you find yourself inside the second portal. The Lodge Services and the core are beyond this portal. This portal emerges from the earth made of the heavy site stone and light metal framing and applied wood surfaces drawing your view upward. As you move through the portal, you leave the base and are released to the top of the platform and emerge into Temporary Exhibit Gallery #2. Here your view is directed either upward toward the sky or downward into the exhibit courtyard. The last portal exits the museum and leads one toward the core and lodge reception. At the entry to the lodge you are confronted by reception area and vertical core that provides direct access to the top level bridge and salon. The lodge dinning room is entered immediately adjacent to this space. The rooms of the lodge are suspended above the dining space by a light weight metal scaffold frame. This open air frame allows maximum air flow and water shedding and reduces the weight of the structure. The circulation path crosses from one side to the other providing varying views of the landscape as you ascend vertically. The rooms themselves are individual pods inserted into the scaffold frame. Each pod has its own solar trombe wall heating panel and opposing doors that open to allow free flow of wind and air for cooling. Every room has a terrace for viewing the landscape and the walls of the Kuelap. The corridor walls are protected by adjustable solar louvers that may be closed in the off season. The top most level of the lodge is on equal level with the platform of the Kuelap. The salon inhabits this space and has vistas that stretch along each side of the fortress wall. A control office and nurse station opposes the stair where you ascend one level to the lookout where the bridge entry resides. The bridge is made of the same light wood and metal scaffold frame and is retractable. When retracted, two beams remain engaged with the fortress and the bridge itself sits over the salon roof level providing sun shade.